Using the Alpatronix MX100 Universal Car Dock and Mount and FM Transmitter is almost as good as having an extra set of hands to hold your cell phone and keep it in clear view. 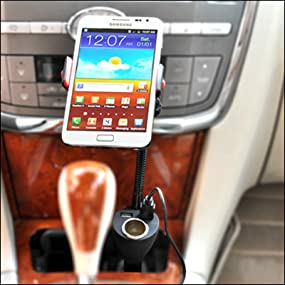 With this cell phone car mount, you can easily use the GPS on you phone without constantly looking down or fumbling your phone. The flexible goose-neck has a versatile holder at one end that serves as a cell phone mount able to hold different sized devices. The holder can fit most any size phone, but if you have an extremely large phone, you may want to remove that bulky case before putting it on this mount. The other end is fitted with an adapter designed to fit directly into your car’s power output access through the cigarette lighter. Any excess cording is easily wrapped around the goose-neck keeping it out of the way. Alpatronix introduces the MX100 Universal Car Dock and Mount, the device that is the intersection of every operation you do on your Smartphone or portable GPS device, while keeping charger and auxiliary cords to a minimum, and out of your way. The MX100 bracket can accommodate all different sizes of Smartphones and hold them up for you to view (for GPS or roadside assistance purposes). From there you can also charge your device or any other Smartphone or tablet in the car using the built-in USB port, and play music through the car stereo using the FM Transmitter. The MX100 keeps all the cables short and out of your way, because everything you need is right there at your disposal: Auxiliary port and USB charger. Like to hardwire your phone into the car instead of the FM Transmitter? Simply use an auxiliary cord (not included) and connect to your car AUX input to bypass the FM transmitter. The MX100 has a built-in USB charger to charge the device that it’s holding or any other Smartphone or tablet (charging cables not included). It conveniently keeps the USB outlet close to your phone to avoid cords from running all over the place! Simply connect the USB cord to the output, wrap the extra cord around the goose-neck, and connect to your phone for neat, convenient charging. Like any other Alpatronix product, the MX100 is covered with our 1 year warranty, so order with confidence and be sure that we have you covered no matter what. Disclaimer: The MX100 will fit MOST power outlets. Please note that the power outlet for each vehicle is different in terms of size, placement and power output. You may find the MX100 not suitable for your vehicle. If you are having difficulty installing the unit or find the MX100 does not suit your needs, please contact us at Alpatronix Customer Support. We'll be more than happy to make an exchange/replacement or provide you with a refund. Remember, all Alpatronix products come with a limited 1-year warranty. Alpatronix Limited Warranty is only available when you purchase your product from authorized Alpatronix sellers. If you are unsure whether you are purchasing from an authorized supplier, please contact Alpatronix for more information. Click here for full details of our warranty terms and conditions.